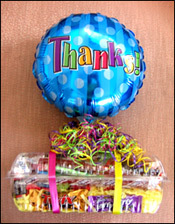 From small hostess thank you baskets to large office or group baskets. Baskets can also be themed for all the holidays, birthdays, Over The Hill, baby showers, new baby, weddings, and other special events. All baskets made per your request. You choose the theme and the price range. Custom made with your choice of candy. Balloons for birthday, Over The Hill, congrats, thanks, love you and more. Even a small basket is loaded with delicious treats. All baskets made per your request. You choose the theme and the price range. 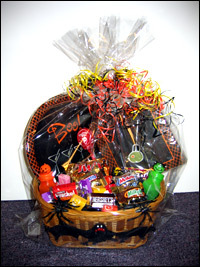 Baskets can be themed for holidays or special occasions. All baskets made per your request. You choose the theme and the price range. 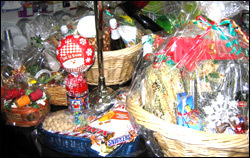 Party baskets include themed plates, napkins and other fun items to set the mood plus some delicious treats. All baskets made per your request. You choose the theme and the price range. 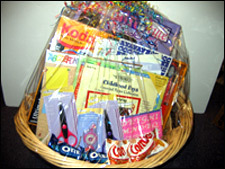 Baskets can be themed for most hobbies or special interests. All baskets made per your request. You choose the theme and the price range. 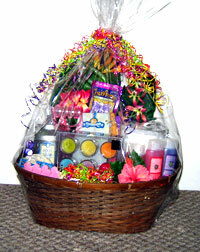 Pamper basket with bubble bath, chai tea, candles and more. 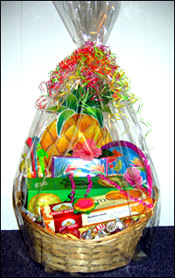 After the goodies are gone the tropical floral basket is perfect for holding towels or other items. 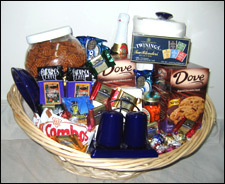 All baskets made per your request. You choose the theme and the price range. theme and the price range. 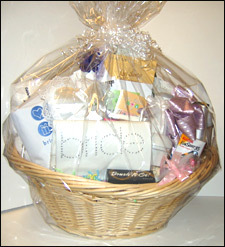 Specializing in gift baskets for Realtors. 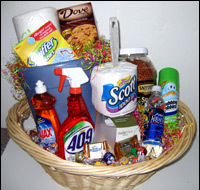 Cleaning basket features cleaning and paper products plus goodies to help celebrate their new home. All baskets made per your request. You choose the theme and the price range. 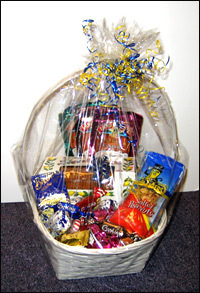 Specializing in gift baskets for Realtors. This basket has all sorts of treats plus a beautiful blue porcelain kitchen set including salt, pepper, napkin holder, trivet, spoonrest and paper towel holder. All baskets made per your request. You choose the theme and the price range.